sweetener, such as maple syrup, honey, raw cane sugar, coconut sugar, coconut nectar, etc. 2. Grind to a fine powder (2-10 minutes, or so), at this time, you may want to add some oil. I personally recommend it, but it’s not necessary. Continue processing until it becomes smooth and creamy, stopping to scrape down the sides of the bowl every minute or two. 3. Continue processing – the nut’s oils are released and as the mixture continues to warm, it should turn creamy and smooth and move around very easily inside the bowl of your processor. If not, it is OK to add a bit more oil until the mixture is runny and blending smoothly. It may take up to 15-20 minutes until it is totally creamy, this depends on the strength and size of your food processor and how many nuts you are processing. Be patient. 4. If you want to add salt and/or a sweetener, do so at the very end. You can choose your nuts to be roasted or unroasted. If roasting, add your nuts in a single layer to a baking pan and roast in a 325º F oven for about 10-15 minutes, watching them very carefully. Toasted nuts have a deeper flavor. I personally find certain nuts are just better raw and others are better toasted, find what you like best. If using soaked, dehydrated (dried) nuts, you may find you need to add a little oil, I didn’t do so with every nut, but most needed a little. I play this addition by ear, I have used none at times and other times I have needed as much as 3 or 4 tablespoons. I really find that it helps the process move along quicker and produces much creamier results. This recipe requires the use of completely dry nuts, so please don’t skip the dehydrating. Always use DRY nuts, either soaked and dehydrated, or un-soaked. This raw cashew butter is lightly sweetened with a little raw sugar and just a dash of sea salt, it is so creamy and rich with a unique flavor. I love it on banana or in a smoothie, in the morning. I used the above simple nut butter instructions, using 2 cups of raw (soaked and dehydrated) pecans to make a pecan butter. I then added about 1 tablespoon of organic grade B maple syrup, 2 teaspoons of ground cinnamon, 1/2 teaspoon of ground nutmeg, a pinch of ground ginger and a little sea salt. This delectable treat tastes like a pecan pie in a jar. It’s amazing as is straight from the jar, served on oatmeal or toast or used as you would any nut butter. NOTE: always process the nut butters completely first, then add in any extra flavors to the finished butter by stirring in by hand or quickly processing for 1 minute or less. 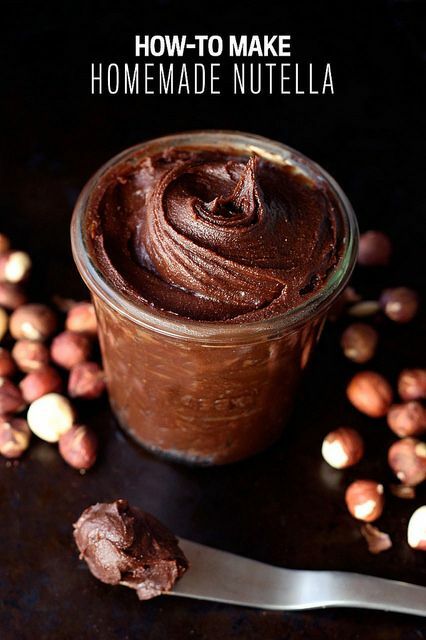 One of my favorite flavor variations is this homemade rich and creamy, sweet and chocolately vegan nutella. It has an amazing flavor from the roasted hazelnuts, it is literally like a grown-up frosting. I can eat this right out of the jar with a spoon and that is basically about all I do with it. I like to savor each spoonful.